The below article provides you with the detail of the process of oogenesis. Here you will find the different stages of oogenesis and also the differences between spermatogenesis and oogenesis. The process of gametogenesis completes in two stages. The sperms are formed in the testes by the process of spermatogenesis . The process of formation of ova from oogonia in the ovaries is called oogenesis. The process of oogenesis completes in the following three stages. The primordial germ cells divide by mitosis to produce oogonia. These oogonia divided by repeated mitotic divisions forming clusters of oogonia called ovigerous cords. These ovigerous cords lie close to the germinal epithelium. When oogonia stop dividing they are called oocytes. In each cluster of oocytes only one enters the growth phase and is known as the primary oocyte, while the remaining oocytes form follicle cells and provide nourishment to the developing ovum, the primary oocyte. The primary oocyte increases many folds. The size increases due to the accumulation of reserve food like proteins and fats in the form of yolk. Due to heavy weight, it is usually concentrated towards the lower portion of the egg forming the vegetative pole. The portion of the cytoplasm with egg pro-nucleus remains often separated from the yolk and occurs towards the upper portion of the egg forming the animal pole. Number of mitochondrial increases and in certain cases they are concentrated in the same places to form mitochondrial clouds. Increase the amount of Endoplasmic Reticulum and activity of the Golgi complex. Formation of the thin vitelline membrane around the oocyte. Due to the increase in the amount of DNA, nuclear sap and number of nucleoli, nucleus increases in size. In the growth phase nucleolar genes which code for ribosomal RNA and are located in the nucleolar organizer region multiply to facilitate the rapid synthesis of ribosomal RNA. This multiplication of genes without mitosis is known as gene amplification or redundancy. In the maturation phase, the nucleus of the oocyte undergoes two maturation divisions. The first division is meiotic; as a result two haploid (n) cells are produced. In this division, cytokinesis is unequal; the large daughter cell with almost entire cytoplasm and yolk forms the secondary oocyte. 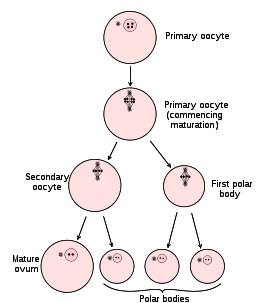 While the smaller one with the haploid nucleus (n) and almost without cytoplasm forms the first polar body which is given off from the surface of oocyte at the animal pole. The secondary oocyte with the haploid number of chromosomes undergoes second maturation division or second meiotic division. This division is also unequal the large one containing yolk is called ovum and small cell is the second polar body. The first polar may also divide thus, producing the total of three polar bodies which degenerate soon. So, as a result of oogenesis, only one functional ovum is formed from a primary oocyte. In most of the vertebrates, the first meiotic division occurs with the commencement of the growth phase, and second maturation division occurs when the egg is activated by the entry of sperm. Spermatogenesis takes place in male gonads while oogenesis takes place in female gonads. In spermatogenesis, each spermatocyte divides into four equal spermatids and all four are functional while in oogenesis, the primary oocyte divides unequally and forms only one functional ovum. Polar bodies are not formed in spermatogenesis while polar bodies are formed in oogenesis. All the divisions are equal in spermatogenesis while there are unequal divisions in oogenesis. The growth phase of spermatogenesis is of short duration while the growth phase of oogenesis is of longer duration. Mature sperm of spermatogenesis are very small, motile and active while the ovum formed during oogenesis is of large size, non-motile and receptive in nature. There is no yolk in sperm while eggs contain yolk. Both the processes take place in their respective gonads. In both processes, the division of germinal epithelial cell takes place. Both the processes involve mitotic division during the multiplication phase. In both the processes, during the maturation phase, the first division is meiosis and second division is mitosis. Both the processes result in the formation of haploid gametes. So these are the summaries of spermatogenesis and oogenesis. In my next article, I will explain the structure of sperm and ovum.